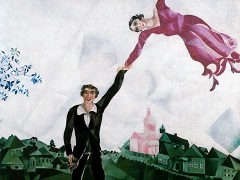 I and the Village is a "narrative self-portrait" featuring memories of Marc Chagall's childhood in the town of Vitebsk, in Russia. The dreamy painting is ripe with images of the Russian landscape and symbols from folk stories. The picture can be broken down into five distinct sections. 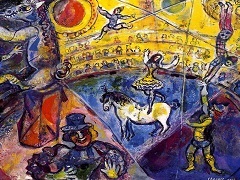 The first at the top right includes a rendering of Chagall's home town, with a church, a series of houses and two people. The woman and some of the houses in the village are upside down, further emphasizing the dreamlike quality of the work. 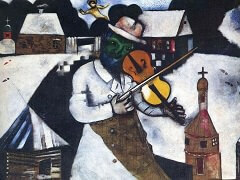 Below that we see a green-faced man who some say is Chagall himself. At the bottom of the work, we see a hand holding a flowering branch. Next to that, an object which some say is a child's bouncing ball - perhaps a plaything from Chagall's earlier days. Finally, we see the image of a milkmaid layered atop the head of a lamb - a motif common to Chagall. 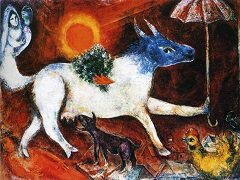 (Cows, bulls and lambs figure in many of Chagall's paintings as cosmic symbols). 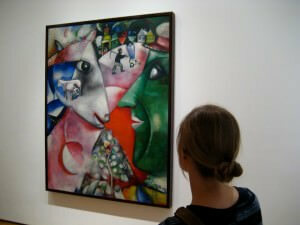 The important thing to note about this picture is that it is a reflection of Marc Chagall's dreams and memories. Also relevant is the fact that many of Chagall's pictures (including this one) have symbols that relate specifically to Jewish folklore. 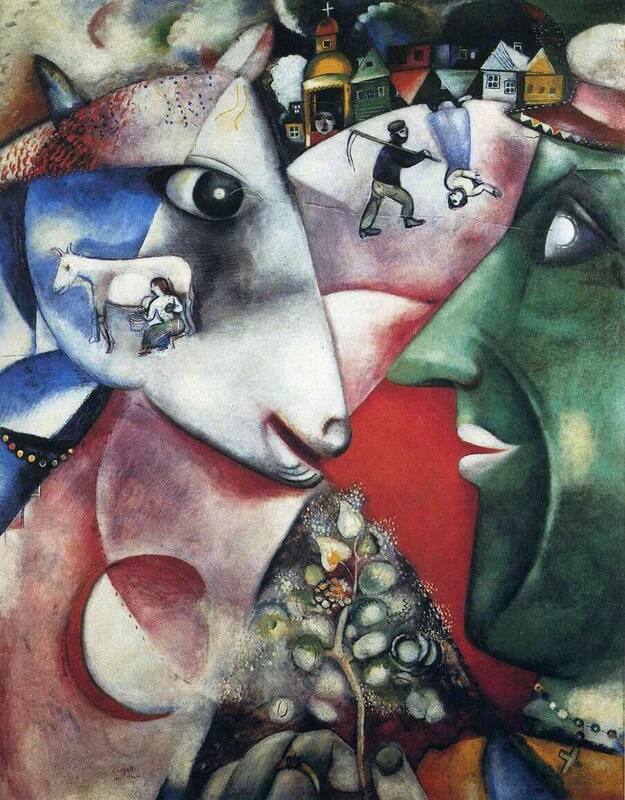 I and the Village is one of Chagall's earliest surviving works. In it, he ignored the laws of gravity. Objects are upside down, things appear to float and perspective is disregarded entirely. 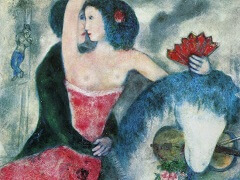 Instead, Chagall chose to focus on color, form and shape. The artist also disregarded natural colors and used his imagination to fill the shapes defined by black contours, characterized by a cubist art style. 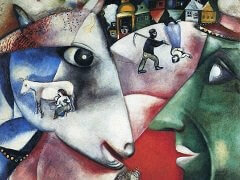 The result is a very emotional work - a visual diary of Marc Chagall's life. I and the Village is currently exhibited at the Museum of Modern Art, New York.